Home Obits HEBER WILLIAMSON “BILL” WELLER JR.
Heber Williamson “Bill” Weller Jr., 87, of Plano, Texas, passed away peacefully April 29, 2018, surrounded by his family. He is preceded in death by his parents, Heber Williamson Weller and Mary Foster Weller; his brother, Charles Knight Weller II; and his wife, Jeanne Tanet Weller. He is survived by his sister, Carol Weller Henkel; son, William “Bill” Weller and wife Esperanza Laura Weller of Irving, Texas; daughter, Leslie Weller Harris and husband Homer P. Harris, also of Plano; and his loving grandchildren, William Heber Weller and partner Emily Schaefer of Cincinnati, Ohio, Jessica Harris Hughes and husband Tyler of San Antonio, Texas, Keith Harris and wife Emily of Lafayette, Ind., and Mick Harris and wife Raquel of Denton, Texas; as well as cousins, nieces, a nephew and extended family. Bill was a loving father, husband, grandfather and a friend to all. Bill was born Aug. 8, 1930, at Methodist Hospital in Memphis, Tenn. Growing up, the family lived in various locations throughout the South due to his father’s vocation as an Episcopal clergyman. The family was residing in Hammond when the United States entered WWII, and he recalled at age 11 running home one Sunday afternoon to wake his father from a nap and break the news of the attack on Pearl Harbor. Bill graduated from Natchitoches High School, class of 1948. He subsequently enlisted in the newly formed United States Air Force and served on active duty from 1949–50. He attended Northwestern State College in Natchitoches, graduating in 1953 with a major in Physics and a Minor in Mathematics, and was in the ROTC program, receiving a commission as an officer in the United States Army Reserves upon graduation. Bill was married to Jeanne Fern Tanet of New Orleans Aug. 21, 1954. They were very happily together for 54 years until her passing in 2008. He worked as a Research Physicist for the USDA at the Southern Regional Research Center in New Orleans from 1956 until his retirement in 1986. Upon retirement, he and his beloved wife built their dream home in the country northwest of New Orleans, near the tiny bucolic hamlet of Husser. They decided to relocate to Plano in 2007 to be closer to family and the services available in a major metropolitan area. 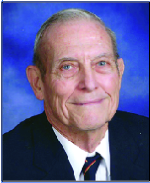 He had many varied interests throughout his life, and was a member of the Sigma Xi Research Society, a Cubmaster of Cub Scout Pack 75 in Metairie, and a volunteer at the Louisiana Nature and Science Center in New Orleans, as well as enjoying fishing, golf and other outdoor pursuits. He was a member of First United Methodist Church of Plano and sang in the church choir. A memorial service will be in the chapel of First United Methodist Church of Plano Saturday, May 5 at 2 p.m. In lieu of flowers, donations may be made to the First United Methodist Church of Plano Music Ministry.